Who says pragmatic utility and classic tones have to be mutually exclusive? Not Rob Pierce, whose Valvetech Amplifier Company deals in classic tones and enhanced flexibility. Case in point – the 25-watt VAC 25. Channel 1 is a half-powered version of a 1959 Fender Bassman; Channel 2 offers a more-modern SLO sound. The review model included two Kendrick Blackframe 10″ speakers. The VAC 25 includes two inputs per channel (perfect for bridging channels). Two Volume controls manage each channel, with Volume 2 offering an additional Bright Boost for Channel 1. Hi, Lo, and Mid chicken knobs, along with Master volume, Speed, and Depth controls, complete the front panel. The rear panel features Presence, Reverb, FX Mix for the passive (non-buffered) effects loop, and a two-position switch for channel 1: the 12AX7 setting has a gainier sound while 12AY7 is cleaner with more headroom. There’s also an external speaker jack and an Impedance selector. Unlike more straightforward amps this size, the VAC 25 requires some time and patience. The controls are interactive and yield lots of aural color. Adding pedals will require even more fine-tuning. Once everything is dialed in, though, rugged chime and mellifluous thickness can be conjured for a variety of musical situations. Testing it with Strats and Teles, all mixtures of earthy Bassman, AC30, blackface, and boosted grind were unleashed. Foot-switchable and powered by the time-tested 12AX7/6V6 tube combination, the VAC 25 yields serious gain. The top two Inputs for both Channel 1 and 2 are high-sensitivity and the lower Inputs are for low sensitivity. Plugging into the top Input of Channel 2 opens the wonderful world of high-gain using both Volume 1 and 2 to sculpt it. Setting the Master low and cranking both Volume controls produces maximum saturation with a light tweedy aftertaste. 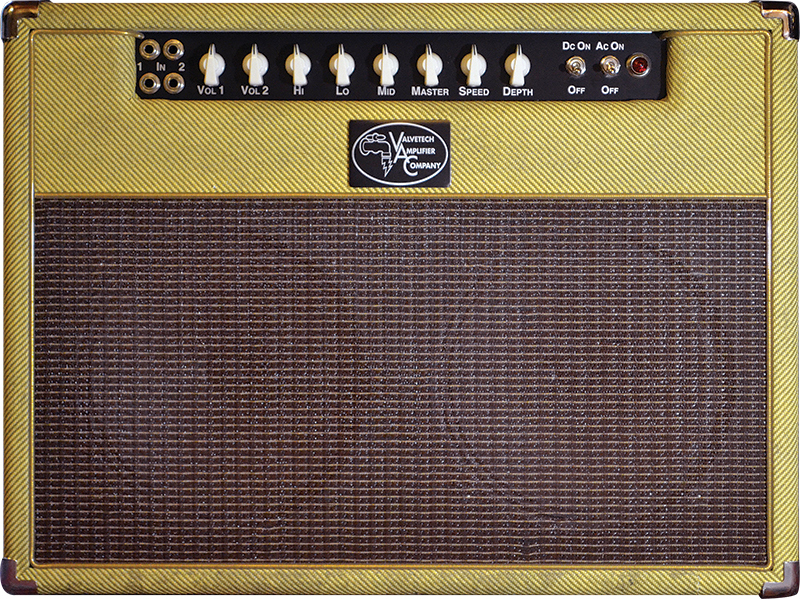 Clean sounds blur the line between an AC30 and a Tweed Bassman, with magnificent reverb and superb tremolo. It elicits luxurious but no-nonsense masculine sounds fitting for any musical situation short of jazz. The VAC 25’s mix-cleaving toughness will work great for funk gigs and thrive in blues or classic-rock performances. It’s a wonderful little amp that’s easy to transport, yet produces dynamic sounds for the discerning guitarist. In other words, beaucoup tonal options in a handsome tweed package.